was a shy, unassuming, young, Jewish, workmen's compensation adjuster in Prague before, during and after World War I who, after his death, emerged as one of the greatest and most influential writers of the twentieth century (despite having published virtually nothing before he died). Indeed, the adjective associated with him, "Kafkaesque," is now widely used in the English language to refer to something that is irrationally nightmarishly complicated. He is, quite naturally, usually associated with the letter "K."
Prague Castle is a castle area--it is more than just a single "castle,", dating back to the ninth century. It is located on a hill in the center of Prague where the rulers of Bohemia, the Holy Roman Empire, Czechoslovakia and the Czech Republic have resided. Hradcany is the district immediately around the castle. The St. Vitus Cathedral in the castle area dates to the fourteenth century. The Vltava River is in the foreground of the picture; photo credit Beverly Blois. 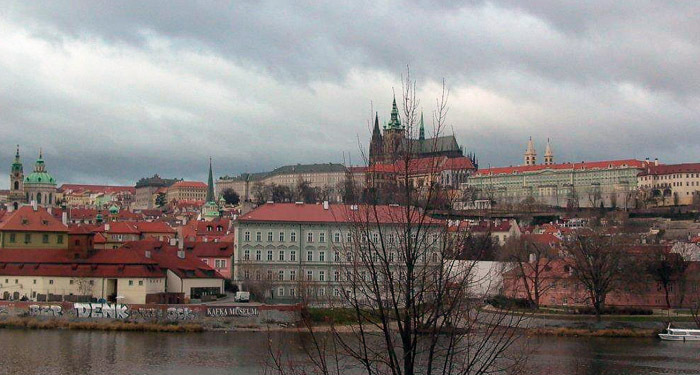 I guess that it is fitting that I begin my remarks with this towering image of the Prague castle, an image that Franz Kafka looked up to and observed every day of this life; he spent all of it in Prague. It is amazing that someone who pretty much lived his entire life within a few square kilometers of Prague could have captured some of the universal paradigms of life in the twentieth century. So, what might I choose to say about Kafka? He grew up in a German-speaking Jewish family in Prague, which was then part of the Austro-Hungarian Empire. All three of his younger sisters died in Nazi extermination camps during the Second World War. He had real problems with his domineering father. Kafka was employed with the Worker's Accident Insurance Institute for the Kingdom of Bohemia. The job involved investigating injuries to industrial workers and assessing how much they should be compensated. K. never married, although had some long-lasting relationships with women. His early death and the bizarre absurdity of his writing has resulted in K. becoming a kind of cult figure. It is certainly a remarkable story. Gregor Samsa awakes one morning to a strange sensation, somehow he has turned into a bug/insect/cockroach/vermin (translation of the German word "Ungeziefer" is problematic; the same word was later reportedly used by the Nazis to refer to Jews. See Professor Poulakis' comments on the difficulties of translation.). I am not sure exactly what sort of "critter" he turned into, but the problem that he had with the hard outer shell leads me to believe that his insect life was going to be a struggle, and it certainly was. As he tries to grasp the irrationality of his new existence, the Samsa family must also adapt, and they do so somewhat reluctantly. The novella is clearly a tale of the outcast fitting into "normal" society (After all, who defines what is normal? 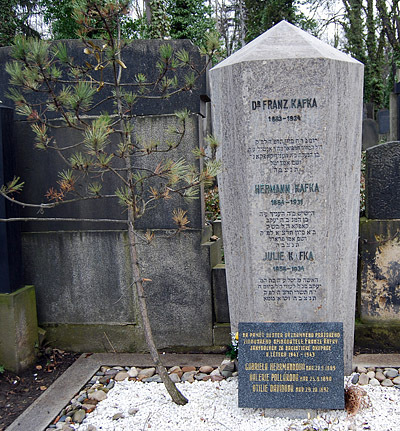 Ten years after Kafka's death the Nazis would define Jews as outcasts from society.). The failure of Gregor to redefine his life successfully and the failure of his family to help him is poignant. And so, the giant Gregor-turned bug dies--what else could be expected--sparing his family the travails of dealing with him, and the family can dream of living happily ever after as they take a stroll. It is an incredibly sad, short novel as Kafka points an accusing finger at the constructs of modern society. You will have to read and decide for yourself if the ending is happy or sad. I first read this about thirty years ago in a college German class. The short novella is all about the impossibility of living in modern, bureaucratic society. K's efforts to navigate his "case" through the massive bureaucratic maze (see the note on the Orson Wells movie below; this labyrinth is portrayed beautifully there) are sheer futility. Even if you have a bit of knowledge it is not enough to help you; you are still doomed. In other words, in modern society you are doomed. I have also read many times the short section of the book called the Parable of the Law, aka Before the Law ("Vor dem Gesetz"), and still cannot figure out the enigma of the parable. The parable is illustrative of the absurdity of life and understanding the meaning of life. Check it out; it is very short. So, Josef K. never is able to figure out what he is guilty, but he certainly was guilty. Of that, there is no real question. In a way, Kafka is suggesting that we are all guilty even if we do not know what we are guilty of, and we are guilty of so much in the modern world. The book has all kinds of religious and moral overtones, and the very ambiguous nature of the writing makes it all the more powerful. K lives to a different kind of end than that spelled out by Nietzsche, but it is still the same sad fate. where Kafka worked; photo credit Beverly Blois. 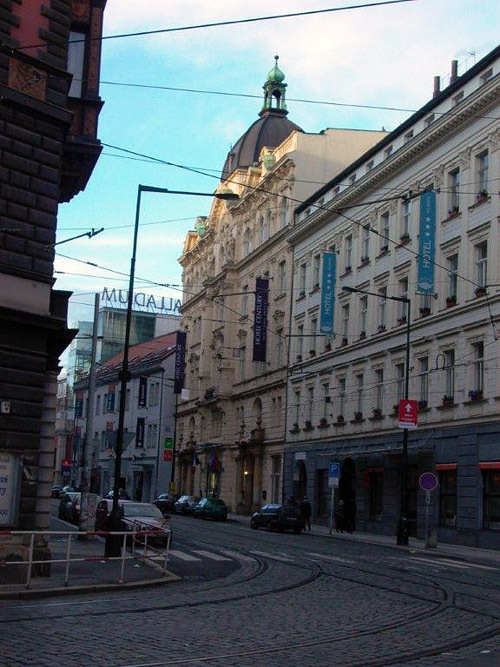 The building is now the Hotel Century Old Town Prague. When you visit Prague today, as my colleague did in December 2011, you can take an entire walking tour of Franz Kafka's Prague. There are 34 stops, including the house where he was born (no 27/I at the corner of Karpfengasse und der Maiselgasse), the schools which he attended, the insurance office where he worked, and his grave. There are some quite good pieces devoted to Kafka on Youtube. You must check out the Orson Wells version of"The Trial" (not the greatest film but very interesting). The movie is a statement, of course, by Wells of the kind of trials that he himself had experienced. Also on Youtube is this old, rather bizarre documentary on Kafka (interspersed with a recreation of "The Trial.") Here is the link to part 6 in which the prison chaplain reveals the parable of the law. One of the great lines of cinematic history is included, "Don't be deluded." The other parts are all on Youtube too.